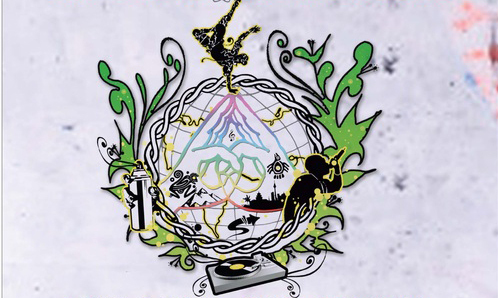 As part of my ongoing effort to read everything about hip-hop education, I recently finished Schooling Hip-Hop: Expanding Hip-Hop Based Education Across the Curriculum, edited by Marc Lamont Hill and Emery Petchauer. I’ve read individual chapters before, but this was the first time I sat down to read the book cover to cover. 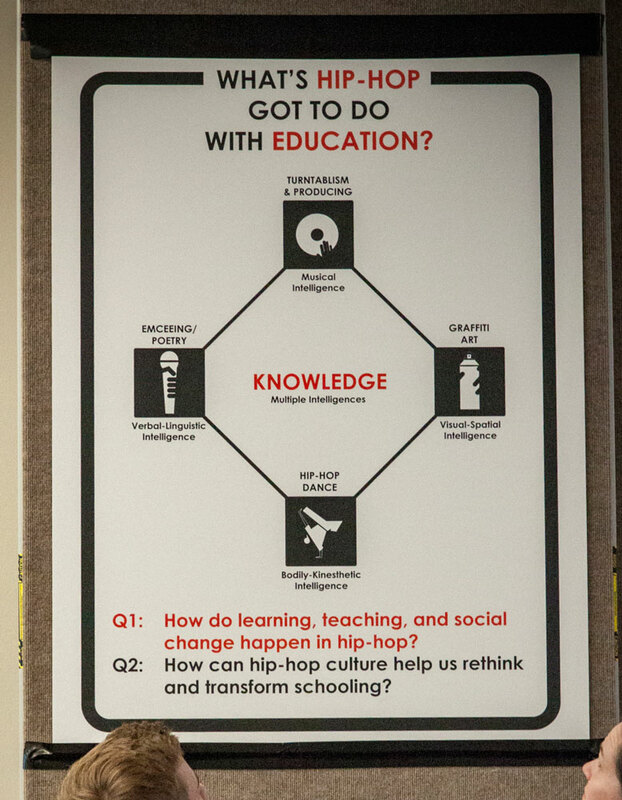 The book, edited by two of hip-hop education’s premier scholars, is a sort of clarion call to teachers and researchers, demanding a deeper and more critical engagement with hip-hop culture in educational spaces. I came away from my reading energized and excited for the future of the field. Published in 2013, Schooling Hip-Hop marks an important shift in what the editors call hip-hop based education (HHBE), one that began some years before the book’s publication and has continued to accelerate. In the early years, efforts to integrate hip-hop into school curricula focused mainly on the analysis of rap lyrics in English language arts classrooms. Educators began using hip-hop lyrics as school texts in order to make the teaching of traditional topics more culturally relevant to young people, and to develop critical literacy skills. Given the poetics of rap, and the many sociopolitical issues raised by rappers, this was perhaps the most natural place to start. 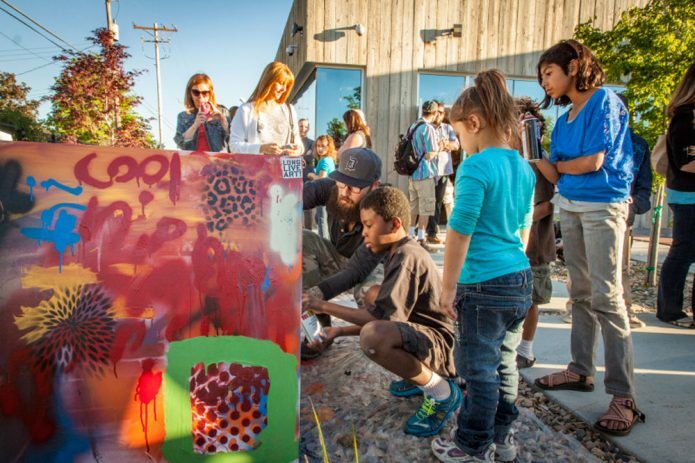 However, over the years educators and scholars have pushed deeper, exploring how the underlying norms, worldviews, and “aesthetic forms” of hip-hop culture can challenge us to rethink how education works, not only for youth involved in hip-hip culture but for all young people. This is what Petchauer (2015) has recently dubbed the second wave of hip-hop education. Chapter one, by Christopher Emdin, is instructive in terms of what it means to use hip-hop aesthetic forms in the classroom. 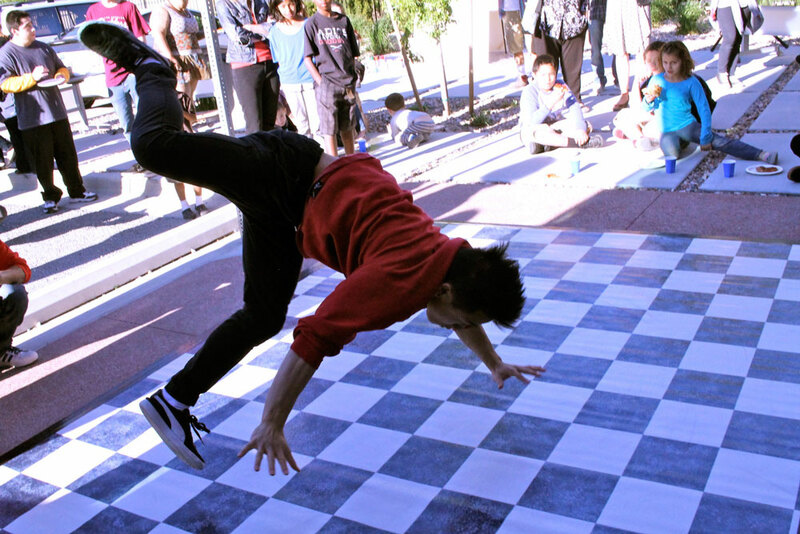 Emdin is a science educator, and his “reality pedagogy” draws direct links between the communicative practices of scientists and hip-hoppers. For example, battling, the foundational process of competitive hip-hop performance, shares much in common with quality scientific debate. 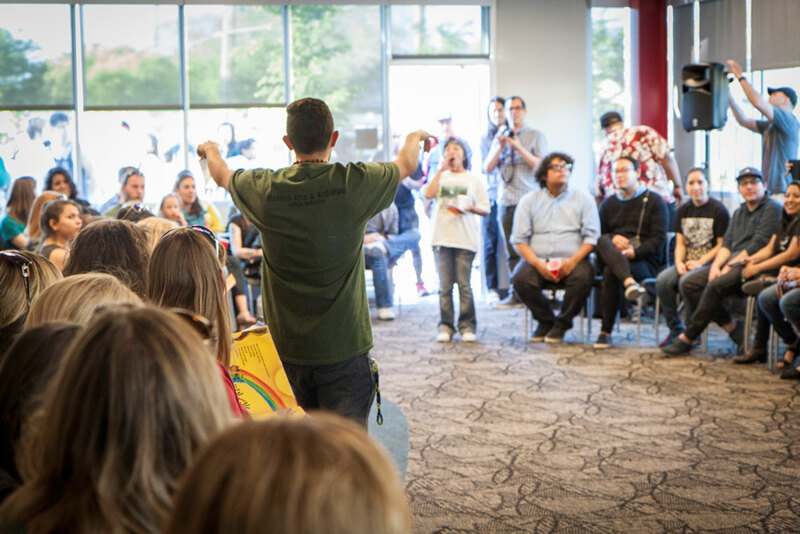 “In hip-hop,” Emdin writes, “exchanges among rappers that support argumentation, active debate, complex thinking, and deep questioning are the norm.” He expands on this idea by suggesting that the hip-hop cypher — in which participants stand in a circle and take turns performing and supporting one another in friendly competition — can be used as a model for rethinking the science classroom. For example, a science classroom based on the cypher might gather students and teacher in a circle and allow for multiple forms of simultaneous participation (e.g. research, assignments, lab work, etc). Chapters two through four, all focused on higher education, demonstrate the use of a variety of other hip-hop aesthetic forms in the classroom. 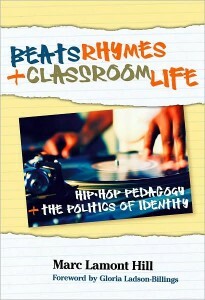 Emery Petchauer analyzes a series of assignments he gave in an urban teacher development course, based on the hip-hop aesthetics of kinetic consumption (the fact that “hip-hop is meant to be felt and not just seen and/or heard”) and autonomy/distance (resistance of compartmentalization and binaries). Petchauer offers the most rigorous and self-critical analysis of his own teaching that I have seen in HHBE. He analyzes the ways that the exercises fell short, and concludes that hip-hop education is not automatically relevant to African American students. At the same time, the exercises he describes drew only minimally on hip-hop aesthetics. For example, for “kinetic consumption” he used a discussion prompt asking which aspects of the classroom text the students “felt.” As a theater educator, I know that there are much deeper ways of engaging students in kinetic learning, some of which may have had more profound outcomes than Petchauer finds. In chapter three, James Braxton Peterson recounts his many years of teaching college-level writing through hip-hop. Having taught his first HHBE course in 1997, Peterson is a trailblazer in the field. What makes this chapter intriguing is that Peterson’s personal trajectory mirrors that of the field as a whole. His earliest attempt at combining hip-hop and composition used hip-hop simply as an object of study. Over the years, however, he has come to see how hip-hop habits, sensibilities, and perspectives can inform and strengthen composition pedagogy. He draws clear parallels between the goals of composition teachers (e.g. revising, quoting, brainstorming) and the practices of hip-hoppers (e.g. remixing, cutting, freestyling). He convincingly argues that exploring the second can simultaneously teach the first. 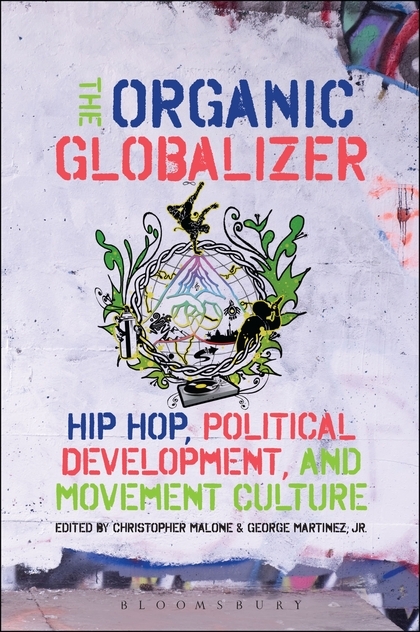 More broadly, he posits knowledge, consciousness, search/discover, and participation as central aspects of hip-hop culture that can be translated into the classroom, though he does what this looks like in depth. Chapter four rounds out the first half of the book. Joycelyn Wilson, founding director of Hip-Hop 2020, describes the pedagogical framework for her hip-hop-based leadership course, Hip-Hop: The Black Aesthetic. Wilson’s course is designed to develop what she calls “authentic hip-hop leadership” or “leadership that keeps it real” In doing so, she draws on hip-hop concepts of realness and authenticity, as well as Afrocentric education models that stress self- and community-awareness. Her ideas of leadership share much in common with the concept of cultural leadership, which I’ve explored previously at this site. The second half of Schooling Hip-Hop consists of four chapters that challenge HHBE research to be more diverse in focus, and more critical of its own practice. Most research on HHBE has been written by teacher-researchers studying their own classrooms. These researchers are generally hip-hop cultural insiders working with low-income urban students of color in high schools. However, as Irby and Hall show in Chapter five, this does not adequately represent the full diversity of educators who are interested in, or trying to use, hip-hop in their classrooms. Based on a survey of pre-service teachers who attended a hip-hop education training, the authors argue that the new face of HHBE may be “suburban certified primary school teachers with more than 10 years of experience who are likely to work in either a suburban school with a majority White student populariont or in a nontraditional urban school (private or charter) that serves a majority of students of color.” This reality suggests the need for new approaches to HHBE practice and research, and attention to the additional possibilities and issues that arise when such teachers take hip-hop into their schools. 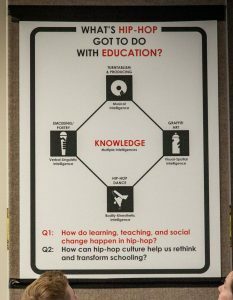 As is often true when an educational approach is in the process of gaining legitimacy, hip-hop education research has been dominated by celebratory accounts of the power and potential of hip-hop in the curriculum. The final three chapters in Schooling Hip-Hop challenge this trend by offering more critical accounts of the difficulties and contradictions of HHBE. Chapter six, by Low, Tan, and Celemencki, explores the many faces of authenticity in hip-hop culture. The authors demonstrate how the discourse of “keeping it real” in hip-hop can mean many things: heterosexual masculinity, blackness, neighborhood, being true to yourself, underground, etc. 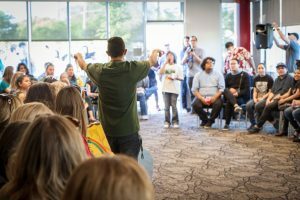 In their teaching experience, the perceived authenticity of hip-hop education helped to connect youth to the curriculum, but sometimes it also got in the way of pedagogical goals. For example, the discourse of “hard” heterosexual masculinity constrained the roles young women could play in the classroom. As with many edited scholarly volumes, the individual chapters in Schooling Hip-Hop are unlikely to make a splash on their own. Most of these authors have written more seminal and more extended pieces about their work elsewhere. However, by combining these eight chapters into one volume, Hill and Petchauer are able to build up some real momentum for the changes they want to see in the field, and create a sense of possibility for the future.